Probably not after tasting Grandma's Bread Recipe that has now become a favorite restaurant recipe! For many, many years making this bread recipe and enjoying the results this was a loved part of family get-togethers at Grandma Lorraine's home. As a child she learned the recipe and method from her mother. They never measured ingredients; just poured and spooned things together. Grandma prepared this fabulous recipe as her “famous” dinner rolls until arthritis made it too difficult and painful. When Grandma and Grandpa were visiting in our home one day, I asked Grandma Lorraine to teach me how to make her rolls. This is how my lesson went. She poured the milk into the pan and before we heated it, I measured it and wrote it down. She put the water into a bowl, and before adding the yeast, I measured it and wrote it down. You get the idea; I measured and wrote down every ingredient she used. Then she taught me how to knead the dough, and how to tell when it was ready to bake. That was a fantastic baking lesson, and a precious time with Grandma Lorraine. I have been making “Grandma’s recipe” for over 30 years. We baked these rolls at the restaurant (with rave reviews) until we could no longer make enough to keep up with business. For a time an employee would come to work at night after the restaurant was closed to make these rolls, but alas, employees who could work those hours became impossible to find. Be daring and try Grandma’s recipe for rolls or bread. I promise you, your family and friends will be astonished when they taste your bread! Is there anything better than homemade bread? I don’t think so. Turn out onto a lightly floured surface and knead until the dough feels smooth, soft and velvety (8-10 minutes). If dough is sticky, lightly sprinkle flour over it and then knead it a little more. 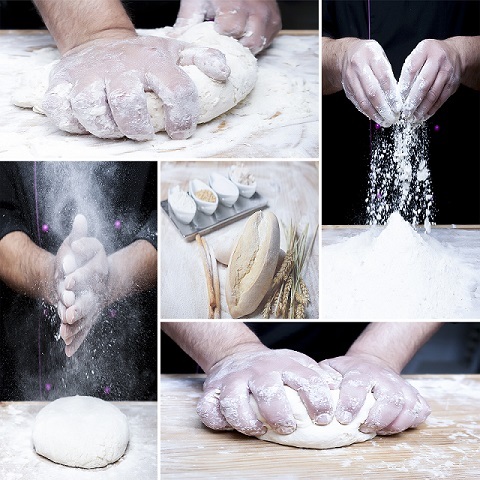 To knead the dough, place the heels of your hands on the front of the dough and push away, rolling or folding the top of the dough back toward you. No need to be "heavy" or "rough" while kneading. You can bake the bread without letting it raise a second time but it will not have as fine a texture. 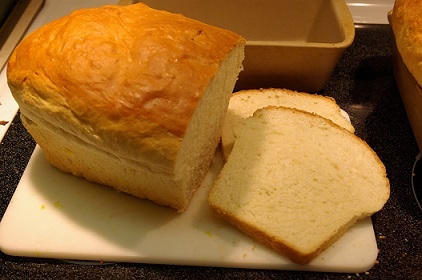 To test a loaf of bread for doneness, tap the loaf out of the pan and tap on the bottom of the loaf. If it sounds hollow, it is done. If it doesn't sound hollow, place it back in the pan and pop it in the oven for a few minutes longer and test it again. Oh! I almost forget to tell you. 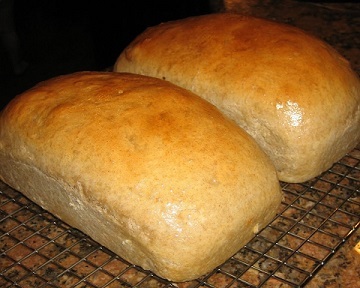 This same bread recipe can be used to bake dinner rolls instead of the loaves of bread. ENJOY the bread recipe and the company of those you share it with! Enjoy all the real restaurant recipes on the website !